How should China respond to Donald Trump’s aggressive trade policy? The answer is: strategically. It needs to manage a rising tide of US hostility. Of the events in Washington last week, the appointment of John Bolton as the US president’s principal adviser on national security may well be more momentous than the announcement of a “section 301” trade action against China. Nevertheless, the plan to impose 25 per cent tariffs on $60bn of (as yet, unspecified) Chinese exports to the US shows the aggression of Mr Trump’s trade agenda. The proposed tariffs are just one of several actions aimed at China’s technology-related policies. These include a case against China at the World Trade Organization and a plan to impose new restrictions on its investments in US technology companies. The objectives of these US actions are unclear. Is it merely to halt alleged misbehaviour, such as forced transfers — or outright theft — of intellectual property? Or, as the labelling of China as a “strategic competitor” suggests, is it to halt China’s technological progress altogether — an aim that is unachievable and certainly non-negotiable. Mr Trump also emphasised the need for China to slash its US bilateral trade surplus by $100bn. Indeed, his rhetoric implies that trade should balance with each partner. This aim is, once again, neither achievable nor negotiable. The optimistic view is that these are opening moves in a negotiation that will end in a deal. A more pessimistic perspective is that this is a stage in an endless process of fraught negotiations between the two superpowers far into the future. A still more pessimistic view is that trade discussions will break down in a cycle of retaliation, perhaps as part of broader hostilities. Which it turns out to be also depends on China. It must recognise the shift in US perceptions, of which Mr Trump’s election is a symptom. Moreover, on trade, the Democrats are far more protectionist than the Republicans.What are the forces driving this shift? China’s rise has made the US fear the loss of its primacy. China’s communist autocracy is ideologically at odds with US democracy. What economists call “the China shock” has been real and significant, although trade with China has not been the main reason for the adverse changes experienced by US industrial workers. The US has also failed to provide the safety net or active support needed by affected workers and communities. Furthermore, the deal reached when China joined the WTO in 2001 is no longer acceptable. As Mr Trump states, the US wants strict “reciprocity”. Finally, many business people argue that China is “cheating”, in pursuit of its industrial objectives. Experience shows that the complaints will never end. A decade or so ago, complaints were about China’s current account surpluses, undervalued exchange rate and huge accumulations of reserves. All these have now been transformed: the current account surplus itself has fallen to just 1.4 per cent of gross domestic product. Now complaints have shifted towards bilateral imbalances, forced transfers of technology, excess capacity and China’s foreign direct investment. China is successful, big and different. Complaints change, but not the complaining. How might China manage these frictions, exacerbated by the character of Mr Trump, yet rooted in deep anxieties? First, retaliate with targeted, precise and limited countermeasures. Like all bullies, Mr Trump respects strength. Indeed, he respects China’s Xi Jinping. Second, defuse legitimate complaints or ones whose redress is in China’s interests. Liberalising the Chinese economy is in China’s own interests, as the astonishing results of 40 years of “reform and opening up” demonstrate. China can and should accelerate its own domestic and external liberalisation. Among the widely shared complaints of foreign businesses, is over pressure to transfer know-how as part of doing business in China. Such “performance requirements” are contrary to WTO rules. China needs to act decisively on this. Third, make some concessions. China could import liquefied natural gas from the US. This would reduce the bilateral surplus, while merely reallocating gas supplies across the world. But doing the same thing for commodities in which China is the world’s dominant market would be far more problematic, since it would hurt other suppliers. Mr Trump may well want China to discriminate against Australian foodstuffs or European aircraft. That way lies the end of the liberal global trading system. Fourth, multilateralise these discussions. The issue of surpluses in standard products like steel cannot be dealt with at a purely unilateral or bilateral level. As a rising global power, China could play a central role in trade liberalisation, thereby strengthening the system and increasing the world’s stake in the health of the Chinese economy. Operating at such a global level brings another potential benefit: it is hard for great powers to negotiate bilaterally, since they tend to view concessions to each other as humiliating. In the global context, however, a concession can be seen as a benefit to everybody. Finally, by operating under the rubric of the WTO, China puts Europeans in a difficult position. Europeans share US anxieties over China’s policies on intellectual property, but they also believe in the rules. If China took the high road, Europeans might feel compelled to support it. We are in a new era of strategic competition. The question is whether this will be managed or lead to a breakdown in relations. Mr Trump’s trade policy is a highly destabilising part of this story. China should take the longer view of it, for its own sake and that of the world. The refusal of bitcoin to just deflate and die, even after the supposed bursting of the crypto bubble, might reflect the extraordinary power of popular delusion. But it may also say something about our dissatisfaction with the current payment system — physical cash and credit cards — and the desire for a faster, cheaper and safer alternative. Fortunately, when not preoccupied by crypto bubbles or fraud, central bankers have been thinking about this problem. One solution under consideration, most prominently in Sweden but elsewhere too, is to introduce a digital version of physical cash. The most straightforward way of doing so would be to let the public open digital checking accounts at the central bank. Not only would such accounts displace most cash transactions, they would also give bank cards a run for their money, to the benefit of consumers. Funds can be transferred instantly within a central bank, without intermediaries or hidden fees. There are several concerns, but two give central bankers cold feet. First, an exodus of deposits could disrupt banks’ business models. Second, if it becomes too easy to convert bank deposits into central bank deposits, a run could overwhelm a bank in minutes. Both concerns are overblown. Moving payments to the central bank need not be destabilising. Only checking accounts are likely to move, not other deposits offering higher interest rates; that is hardly the end of banking as we know it. Bank fees from payments services would fall, as they already are doing, due to competition from the likes of PayPal. But the loss for banks is a gain for consumers. Although banks might push up lending rates to compensate, that is not necessarily a bad thing — certainly not in Europe, where a shift from bank to capital market funding is a policy goal. Above all, a system where a central bank provides payment services while banks focus on credit is more stable. It removes banks’ capacity to fund loans simply by issuing deposits and relying on borrowing to cover unexpected outflows. This should reduce the incidence of bank crises and taxpayer-funded bailouts in the name of rescuing the payments system. As for digital bank runs, it is true that in a crisis even non-checking deposits may want to fly to the safety of the central bank, and the capacity to do so with the click of a button would indeed make life difficult for crisis managers. But there is nothing about digital currency per se that prevents a central bank from slowing the process. The authorities could arguably manage the process in a more orderly way, without queues outside banks and without disrupting the broader payments system of transfers between central bank checking accounts. There is a more ambitious variant of the above: a “central bank coin” that resides on a blockchain, an electronic database of transactions. The central bank would issue coins against cash and banks’ reserves at the central bank. If it then stood ready to freely exchange coin, cash and reserves at par, the main problem plaguing bitcoin and other cryptocurrencies as money — extreme price volatility — would be resolved. A key advantage of a blockchain-based currency over central bank checking accounts, or indeed the current system, is security. A unitary ledger residing on a network is harder to tamper with than one in a single location. In an age where everything from elections to email is hackable, protecting the payments system from shocks to the liability side of banks should be high on the policy agenda. Certainly, there are issues with blockchain, including processing speed, energy use and safeguards against money laundering and terrorist financing. But these are problems of practice, not principle, and there are already solutions within reach. The question for policymakers is how long they can afford to wait before falling behind in payments technology. The recent turmoil in crypto markets should not distract central banks from embracing digital currency to deliver a system that is less costly in good times and less unstable in turbulent ones. - The Australian economy is in a unique situation; there are large enough differences between the US and Australia to make a comparison difficult. 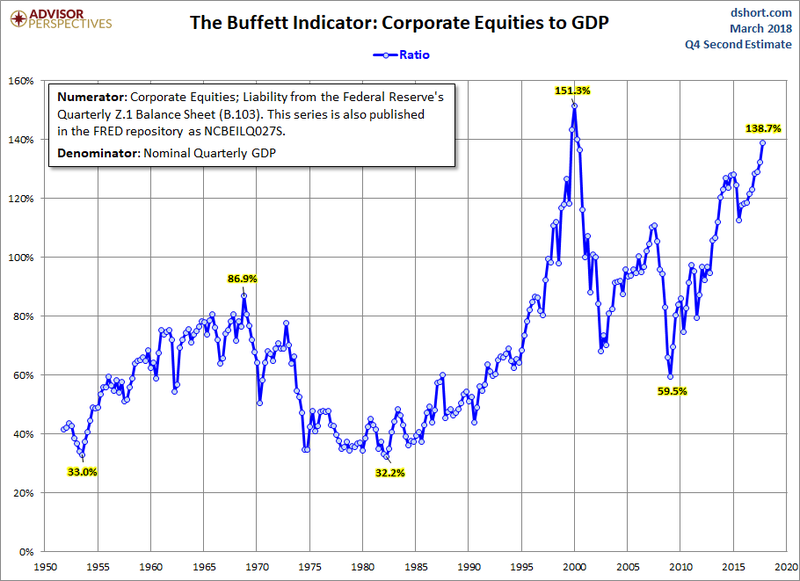 - The stock market is very expensive right now (one could argue either a bubble is forming or we already have one). - The Fed could easily over-tighten. 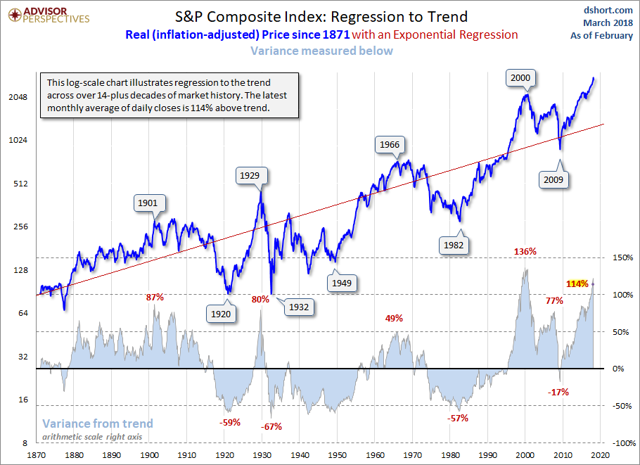 Over the weekend, Dividend Sensei ("DS") published a very well-written and researched article titled, The Next Recession Could Be Decades Away. I agree with about 75% of his analysis. However, I very respectfully disagree with his conclusion that the next recession could be decades away. I want to add that this is very much a situation where two people can look at the same set of facts and derive a different conclusion. Many Americans were understandably disappointed by the anemic 2% or so rate of GDP growth since the financial crisis. Normally recoveries are far sharper, and V shaped. However, financial crashes caused by excessive household leverage, in this case the housing bubble, are a different beast altogether. Consumers get caught up in some type of buying mania. They take on more and more debt to buy a good that continues to escalate in price at parabolic levels. On the other side of the crash, consumers are left with massive amounts of debt that they have to pay off. Instead of buying goods and services during the early parts of the expansion, they use a larger percentage of their earnings to pay off debt, which retards overall economic growth. During this expansion, the strongest PCE Y/Y growth rate was 5%. But PCE growth ranged from 3% to 5% for the last nine years which is far below the pace of previous expansions. Despite different approaches, our conclusions are the same. Any economy that is trying to recover from a debt-fueled mania will take longer to recover as households and businesses deleverage on the other side of the recession. Despite our agreement on the fundamental nature of the US economy's basic post-GFC structure, I disagree with the following foundations of this "decades away" argument. 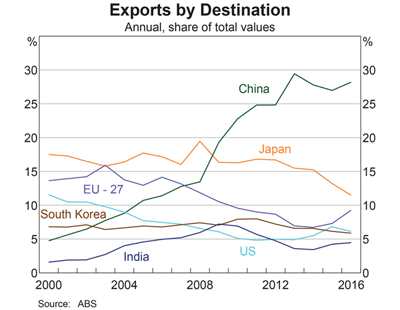 Australia grew consistently because of its unique relationship with China. Chinese growth is based on massive government-funded infrastructure spending. Australia has supplied the raw materials for this expansion. As a result, the Australian economy has had two large injections. 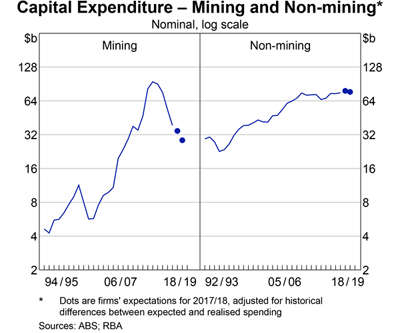 Mining investment in Australia has increased at a near exponential rate for about 20 years. Exports to China doubled after the GFC. Remember that China also avoided the recession by increasing its infrastructure spending. The US doesn't have a comparable situation, which, in my opinion, makes the Australian comparison less than robust. 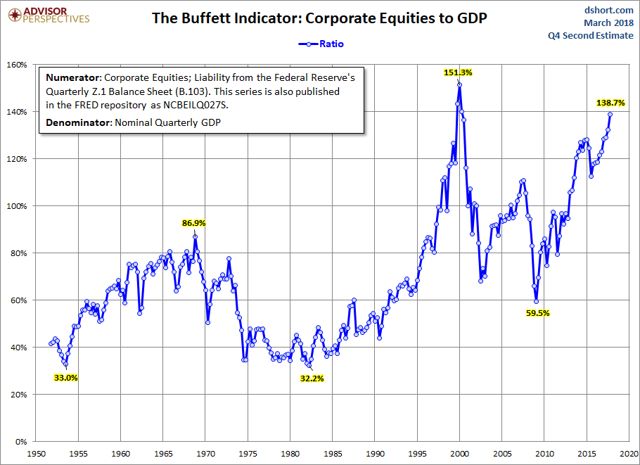 The market capitalization/GDP ratio is nearing levels seen at the end of the 1990s market. 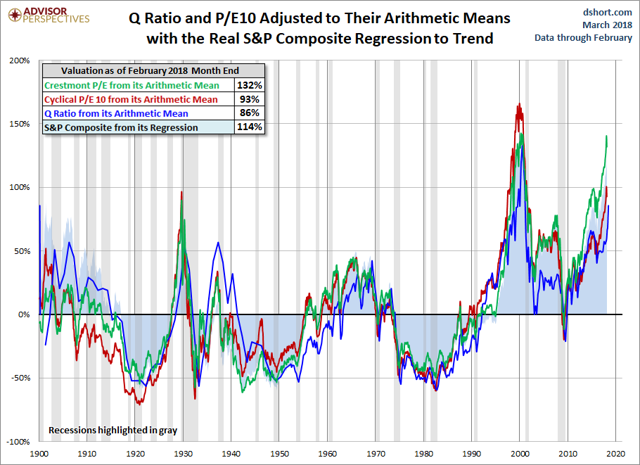 Other valuation measures are also very high by historical comparison. Markets revert to mean. And right now, the market is very stretched compared to its historical mean. This is not to say that there are no fundamentals supporting this rally. As I've noted several times, corporate earnings are very strong. But that doesn't take away from the fact that current market valuations are very stretched by a number of standards. 1) It doesn't want to be caught flat-footed as to inflation - it doesn't want to let inflation run too hot and then to play the game of catch-up. 2.) 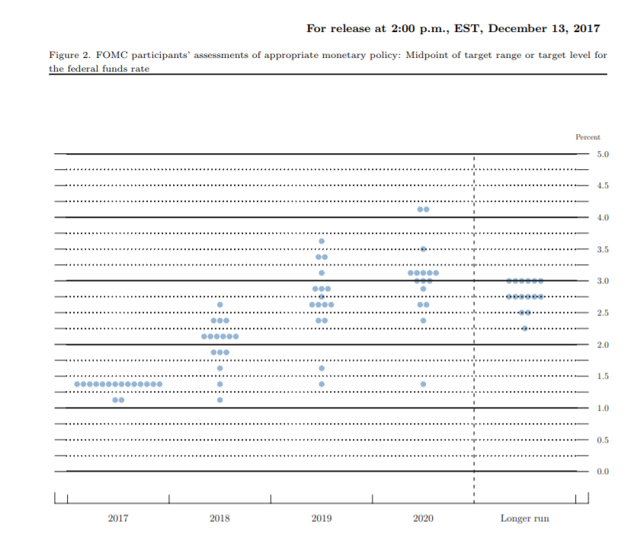 It very much wants to "normalize" policy - return interest rates to higher levels as a sign that the economy is "back to normal." However, the possibility exists that the Fed will tighten too much and send the economy into a recession. This is probably more an editorial than data issue. Given the sophistication of DS's analysis, I'd bet he knows that economists just can't see multi-decades into the future. As a general rule of thumb, the leading indicators can telegraph activity in the next 6-12 months and the long-leading indicators can guide you to maybe the next 18-24 months. But anything longer than that is just an outright guess. I want to reiterate that DS's article could very well be right. His analysis was very well thought out and reasoned. I simply see it differently. The difference today is that the actors filling the power void aren’t concerned with self-governance; they’re organized crime groups fighting for turf, and vigilante groups fighting for peace. 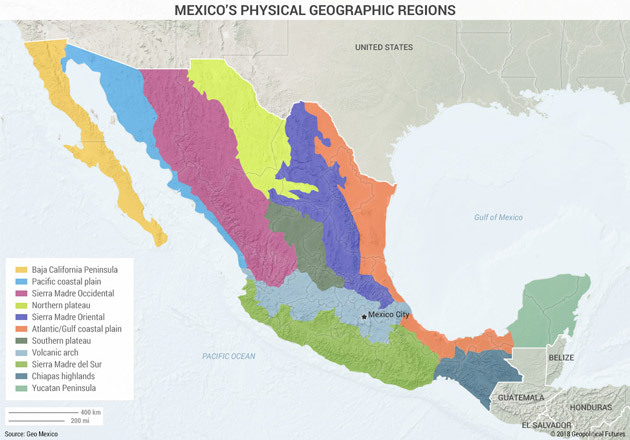 After so many instances in which local populations benefited from taking matters into their own hands, there is a sense of local entitlement to self-governance. The result has been widespread violence, the deterioration of local institutions, and a central government that depends more and more on the military to re-establish law and order. Cycles, cycles everywhere. We’ve already discussed the current state of the U.S. business cycle, arguing that the expansion should last for a while, although it is more advanced than in Europe. However, business cycles aren’t the only creatures living in an economic zoo. They are simply the most popular within the modern macroeconomics. The post-war business cycles lasted, on average, almost 6 years. But economists distinguished also shorter cycles, called Kitchin inventory cycles, which are believed to be caused by lags in entrepreneurs’ reaction to the market signals (and the resulting changes in inventory accumulation or reduction), and which average 40 months in length. The typology of cycles also recognizes much longer cycles: the Kuznets swing and the Kondratiev wave. The former is caused by infrastructural investments and lasts 15-25 years, while the latter is linked to changes in technology and keeps on about 45-60 years. As the Kuznets swing is sometimes considered to be a part of the Kondratiev wave, we focus here on the latter. • Winter: a phase when the excess capacity is reduced by deflation and economic depression, debt is repaid or repudiated. There is stock market crash and high unemployment, social conflicts arise. In particular, Joseph Schumpeter significantly modified the original concept, linking the cycles to innovations. Their accumulation leads to technological revolutions, which transforms societies and launch Kondratiev waves. 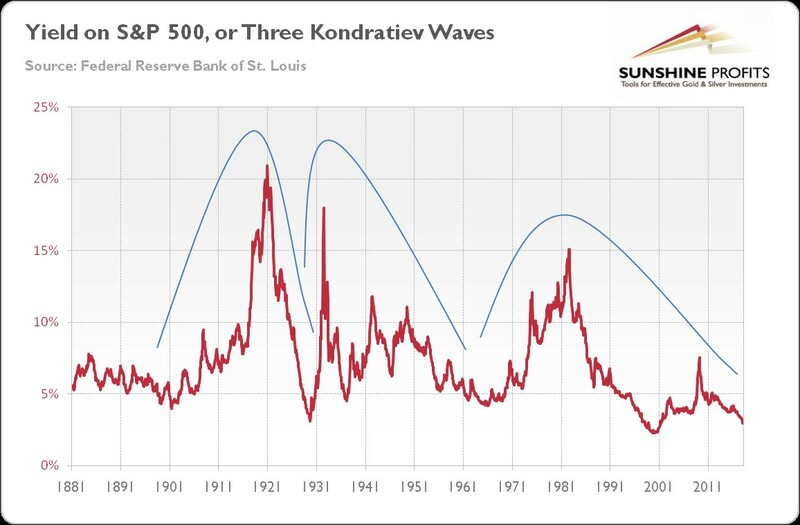 The chart below displays the last three waves, which are approximated by cycles in the rolling 10-year earnings yield (inverted P/E ratio) on the S&P 500 Index. When the new technology enters the scene, the average return starts to increase, while when technology approaches its limits, the average return on equities declines. Chart 1: Rolling 10-year earnings yield on the S&P 500 Index from 1881 to February 2018. We currently live in the fifth age, but the sixth technological revolution is coming. Brace yourself for The Age of Cybernetics, High Technology and Clean Energy. Just think about all these technology breakthroughs: nanotechnology, biotechnology, renewable energy, machine learning, artificial intelligence, 3D printing, Internet of Things, robotics, electrical and autonomous vehicles, etc. OK, robots are great, but what does this have to do with gold? Well, each long wave brings new ways of doing things more efficiently, increasing economic productivity and boosting the pace of growth. Some economists explain the Great Recession and the following slow recovery pointing to reaching the limits of the present technology. Thus, when the sixth revolution arrives, gold may struggle. However, gold bulls shouldn’t fall into despair. The diffusion of technology takes time – and it occurs with pain on the way. Technological innovations lead to social changes, which can create conflicts or even wars (the new technology empowers certain people who threaten the old elite). The implications are clear. The new technological revolution will bring prosperity, but it will be born in pain. And what it the best cure for pain? You are right, shiny gold, which hedges against economic turmoil. It all depends on the phase we are in right now. As the global economy recovered and now expands, inflation is low, while stocks still rally, we enjoy spring. This is why gold’s remained in a broad sideways trend in the last few years. However, as we are on the edge of the next technological revolution, confidence is finally rising and there are worries about higher prices, and we could enter the summer phase in the not-so-distant future. As inflation goes out to sunbathe during summers, gold should welcome that transformation.